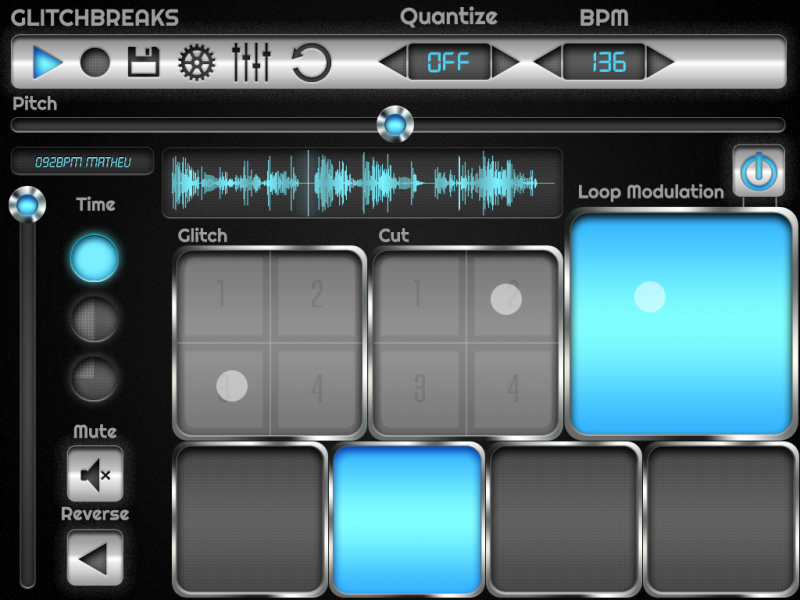 Glitchbreaks by Alex Matheu is a Mobile Audio App. 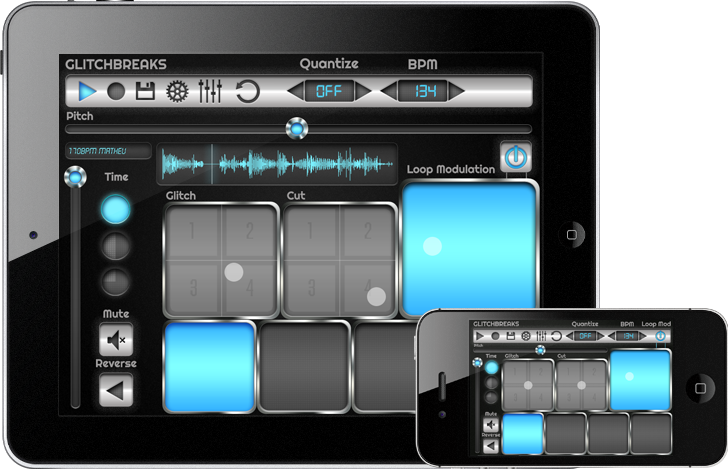 Glitchbreaks is an iOS Universal manipulation tool for "Glitching" breakbeats. Glitchbreaks uses four audio channels setup like mute groups. You can quickly switch between them to construct new beats, or manipulate loop points to "Cut" or "Glitch" the breaks. Glitchbreaks can be used as a performance tool to juggle breakbeats or destroy sounds at a granular level. 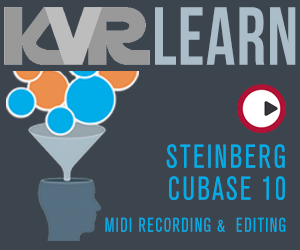 You can make interesting effect like sounds by manipulating pitch, loop start, length, and cutting the beats with fluid responsive controls. You can record your performance and bring it into iTunes through file sharing, or copy it out into another iOS application via Audio Copy and Paste. You pre-determine the length of your recording by bars to easily make pieces to bring into a song without the need for further sample editing. Auto-BPM detection will detect the tempo of a sample you copy into Glitchbreaks (you just need to specify the bars between 1-4). You can turn this feature off in order to manipulate audio that doesn't have tempo, this is especially useful for manipulating voice samples. 90 high quality factory beat loops. Audio Copy and Paste and General Pasteboard support (Both Copy and Paste). 4 continuous looping channels with 4 channel mixer. Auto-BPM detection / with on/off setting. Set the BPM up to 2.9 times the original sample BPM. Waveform Display with accurate position indicator (iPad only). 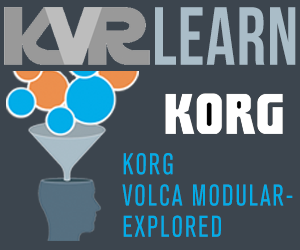 XY-Pad Loop Modulation (Loop Length, Loop Start). Cut Editor / Sequencer with 4 user save slots. XY-Pads for selecting 4 Glitch or Cut styles. Index Tracking for keeping the time of the beat when manipulating it. Independent time settings Whole, Half, Quarter. Quantize for Cut and Glitch operations. Recording to 44.1kHz 16-bit Wav files. Set custom record length in bars. Load sounds while playing without hitting stop. Background Audio mixes with other applications.